This big oil-on-canvas painting, representing Bartolomeo Eustachi showing his anatomical tables to his students, is a work (1884?) of painter Mariano Piervittori (1817-1888). 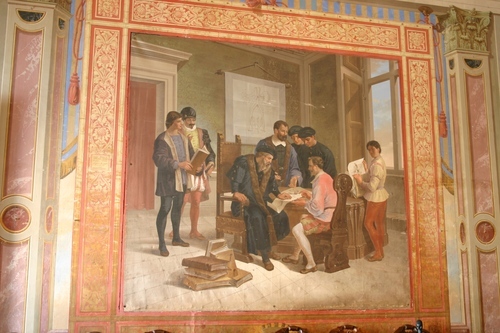 It can be seen in the council room of the town hall in San Severino Marche (Piazza del Popolo, 45), not far from Eustachi's marble bust by Ercole Rosa. Photos by Luca Borghi ti.supmacinu|ihgrob.l#| (July 2012), courtesy of Comune di San Severino Marche.